If you missed the first part of my trip, check out what I found in Dayton, OH in Part 1. You can also find my photos on Flickr. The last day of my trip was spent in Cincinnati, where I had not been since my college days. I’m a big baseball fan (Go Cubs & Mariners) and I could not pass up a chance to see a day game at the Great American Ball Park. The Reds were taking on the Giants, and before grabbing my cheap $7 ticket I went to the huge new brewery and taphouse across the street, the Moerlein Lager House. They had six house beers on tap, and I quite enjoyed their Over-the-Rhine Pale Ale and the Barbarossa Double Dark Lager. This is really a perfect pre-game spot, with plenty of room and an upstairs patio. They also had quite a few nice guest taps, including Founder’s Breakfast Stout, Victory Prima Pils, Bell’s Oberon, and Rogue Chipotle Ale. I went into the game early to explore the ballpark and see what beer options I could find, of course. While most concession stands had pretty bland beer selections, it wasn’t difficult to find some great beers. The gem of the park was a stand located just back from section 114 that had Bell’s Oberon and Kentucky Bourbon Barrel Stout on draft, as well as a selection of cans/bottles that included Founders All Day IPA, Southern Tier Hopsun, 21st Amendment Bitter American, and Bell’s Two Hearted. The ballpark itself was just fine, but not the type of park that really makes an impression. There was a nice view overlooking the river, and food options were plentiful. I had to get a little work done before heading out that evening, and I wasn’t too sad about leaving the game a bit early when I saw that Sean Marshall (also on my fantasy baseball team…) blew the save in the 9th, leading to a Red’s 6-5 loss. Go figure. From my downtown hotel, it wasn’t a far walk to the neighborhood where I’d spend the rest of the evening. Called Over-the-Rhine, this historic area is a mix of old architecture, bars and restaurants intermingled in an area that has streets of condos, old houses, and some lower rent housing. It seems like a very diverse area in a state of change, and I’d overheard a couple people talking about the neighborhood earlier saying that they still didn’t think was very safe these days. I didn’t really get that sense when I was there. My first stop was at The Lackman, which featured 14 beers (13 craft + Guinness) on tap and around 20 craft bottles/cans. The space was small but comfortable, with lots of sun streaming in through the windows. The atmosphere was lively, and they were pretty packed for happy hour. Aside from the bartender telling me they don’t have a beer list because it changes every day (that doesn’t stop most beer bars around the country from having one, or a chalkboard at least), service was good. I enjoyed my Founder’s Old Curmudgeon, and other offerings included Avery Maharaja, Anchor Summer Ale, 21st Amendment Monk’s Blood, Luna Coffee Stout, and several more. Upon the bar back’s suggestion, I next ventured down the street to a restaurant called Bakersfield OTR to take care of my rumbling stomach. This was just the place I was hoping to find. They specialize in amazing tacos, and I enjoyed a couple along with some of the best guacamole I’ve ever had. Their 8 taps of beer included 5 craft beers and 3 crap beers, but I was delighted to find a beer featuring roasted ancho chile’s from 5 Rabbit Cerveceria in Chicago and an IPA from Dark Horse Brewing in Michigan. Most patrons were enjoying the tempting margaritas, or $2 PBRs. Bakersfield was also packed with the after-work crowd, and I was lucky to be by myself and slide in at the end of the bar (I heard the waitress tell a group of 4 it was over an hour wait for a table). The garage door windows were up, and despite being very busy the place had a relaxing vibe. Life size Jenga at Neons Unplugged. Wandering around just a few streets over I heard some good live music coming from the back of a bar and decided it was my duty to check it out. What I stumbled upon was a place called Neons Unplugged, and undoubtedly it would be my bar of choice for a sunny evening if I lived in Cincinnati. The inside bar is pretty non-descript, but out back they have a huge year-round outdoor patio with full bar featuring a few craft beers on tap and quite a few bottles/cans. They were also making plenty of great-looking cocktails. In addition to a bluesy, rocking band, there was also a full-size bocce court (YES!!! 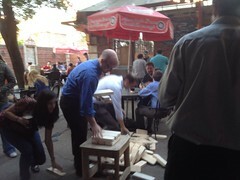 ), a life-size Jenga game, and a lot of tables. The patio was busy, but there was plenty of room to pull up to the bar. It looked like they also had a grill set up in back with burgers/sandwiches, but I didn’t get too close of a look after the meal I had just had. People were roaming about, many with dogs, and it was a friendly crowd. My final stop of the night was just up the street at Motr Pub. This dark, slightly hipsterish music club had a surprisingly good selection of beers, including Three Floyd’s Alpha King Pale Ale (love it), Great Divide Espresso Yeti, and lots of canned craft beers. I hung out here for a bit too long, but I enjoyed talking to the bartenders and the live music that took the stage after a bit. I was about to order one last Alpha King when I came to my senses and booked it for my hotel room and the bed that awaited me there. Overall, I was pretty impressed with what I found in both Cincinnati and Dayton. As someone on Twitter said to me, “It’s not beer Mecca.” But, there were plenty of spots worth visiting and beers worth drinking. I’ll happily look forward to returning.